Two chemical explosions sparked a fire early Thursday morning at a manufacturing plant in Crosby that has been inundated with six feet of hurricane floodwaters. 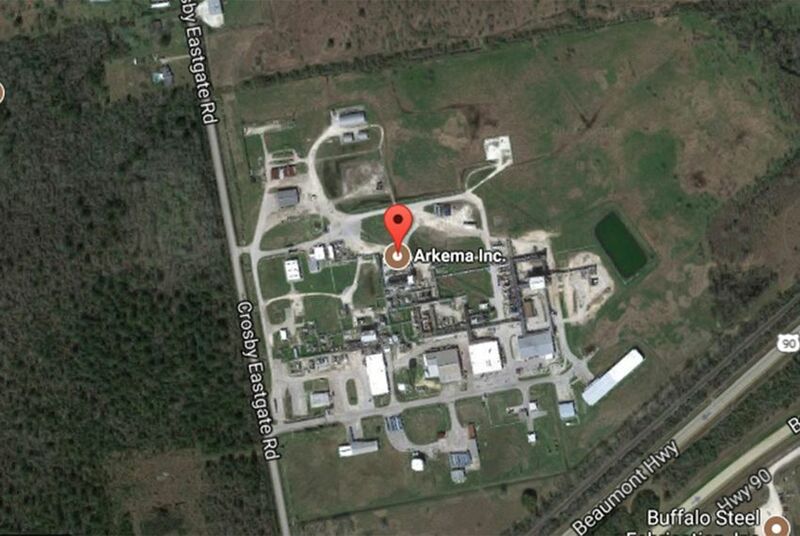 Arkema Inc., the owner of the plant, warned Wednesday that the organic peroxides used in the site’s manufacturing process had begun to heat up after the plant lost its primary source of power and backup power from generators. Without electricity to power refrigeration, the chemicals — stored in 18-wheeler box vans throughout the plant — were expected to degrade, possibly leading to some type of explosion or fire. The U.S. Chemical Safety Board announced Thursday that it will investigate the explosions in hopes of learning more about which specific chemicals were stored at the plant. The plant has nine vans, each with 36,000 pounds of organic peroxide stored in cardboard containers. Containers in one of the vans popped and caught fire, producing smoke that wafted 30 to 40 feet into the air, local officials told reporters early Thursday. Arkema expects each of the vans will eventually ignite as they lose power and refrigeration. “Please do not return to the area within the evacuation zone until local emergency response authorities announce it is safe to do so,” the company’s statement said. The byproduct of the fires would be typical “black smoke with carbon particles in it,” Royall said. Authorities evacuated a 1.5-mile radius around the facility Tuesday. They also advised locals to limit their exposure to the smoke by remaining indoors with their windows closed. His office and the Harris County Sheriff’s Office downplayed environmental and public health risks from the plant, going as far as suggesting that “explosion” was not the proper terminology for the chemical reactions in the vans. Meanwhile, federal authorities have sent mixed messages. At a press conference in Washington, D.C., Federal Emergency Management Agency Administrator Brock Long called the plume wafting from the plant “incredibly dangerous." But the U.S. Environmental Protection Agency said in a news release Thursday that “there are no concentrations of concern for toxic materials reported at this time.” The agency said it was reviewing data from an aircraft that surveyed the scene shortly after the explosions. "We will consider using any authority we have to further address the situation to protect human health and the environment,” EPA Administrator Scott Pruitt said. The county has been consulting with Arkema and outside experts since early Tuesday about how best to handle the chemical reactions. “If you want to call it an explosion, there’s a technical definition, and I’m not going to get into that,” he told reporters. Fifteen sheriff’s deputies at the scene were taken to the hospital Thursday morning after reporting that smoke had irritated their eyes and throats. All have been released, the sheriff’s office tweeted at 9:20 a.m. While the company has downplayed the potential impacts of the explosion — Arkema CEO Rich Rowe said Wednesday that any sustained environmental impact would be “minimal” – environmental experts expressed concern about fallout from the explosion. Carman said the smoke indicates the presence of polycyclic aromatic hydrocarbons, a known carcinogen. Depending on the wind, these chemicals could spread quickly to the surrounding area, he said. Still, it’s difficult to predict the exact impact of the fumes given the minimal information that Arkema has released, according to Bakeyah Nelson, executive director of Air Alliance Houston. In a conference call with reporters Wednesday, Rowe refused to release the company’s federally mandated risk management plan or the plant’s chemical inventory. The Texas Commission on Environmental Quality said it was among several local, state and federal agencies monitoring the plant. The state agency has twice flagged health and safety violations at the Crosby plant in recent years. In 2006, it fined the company $3,950 following a fire that released 32,000 pounds of volatile organic compounds, as well as particulate matter, carbon monoxide and nitrogen oxide, into the air. As part of a settlement, Arkema paid the state $3,160. Then in 2011, TCEQ fined the company $20,300 for failing to maintain proper temperatures for a thermal oxidizer, which is used to filter hazardous gasses before they are released. Arkema paid the state $16,240 after that incident. And in February, the plant was fined $90,000 for 10 safety violations found during an Occupational Safety and Health Administration inspection. The violations were deemed "serious" — meaning the hazards could have caused accidents or illnesses that would "most likely result in death or serious physical harm." Rowe said Wednesday that past issues with the plant had no bearing on this week's events.